There seems to have been a lot of mental health in my work in recent weeks. I’m pleased for two reasons. Personally, as someone who used to work for Mind it’s a subject that remains dear to my heart. But also, because this increase in mental health related activity is a sign that the mental health sector is focusing increasingly on the needs of people with long-term conditions. At the moment that’s focusing much more on conditions like diabetes or cardiovascular disease. 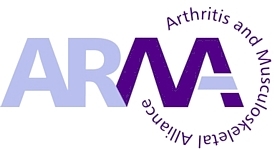 ARMA is here to make sure that musculoskeletal conditions are included. National Voices recently held an event on mental health and long term conditions that showed just how much of a priority it is across long term conditions. There is increasing evidence about the relationship between mental health and MSK conditions. A recent survey by Arthritis Action found that around half of those surveyed (49%) said that their pain often or always makes them feel down or depressed. And NRAS have published a report which found that 2 out of 5 respondents with rheumatoid arthritis have never been asked about emotional wellbeing, despite NICE guidelines stating that all patients should be checked for depression. Clearly there is a long way to go. An additional £2 billion was allocated for mental health services in the recent budget, and ARMA will be working to ensure that some of this goes towards offering timely mental health support for people with MSK conditions. Last week I heard a presentation from someone delivering an excellent mental health service, integrated into clinics for long term conditions. Sadly, not musculoskeletal, but the principles would work just as well in an MSK clinic. One of the benefits of her approach is that it gives clinicians treating physical health conditions the confidence to address mental health. Look out for a webinar next year on this. Look out for more activity on this from ARMA and from our members in the coming months. Our conversations with the mental health sector show that there is an increased awareness of the needs of people with MSK conditions. It feels like a good time to seize the opportunity and drive improvement, the MSK sector and the mental health sector together. As always, ARMA is all about collaboration. This is an area where this could really make a big difference.